This exclusive bar that emerges from 24th floor of the building’s west side (one of The Okura Prestige Bangkok’s most notable architectural elements) provides a wide selection of beverages and assorted tapas from the hotel’s various dining outlets, amongst a view like no other. The lounge is a perfect spot for Okura High Tea and Chocolate Boxes, an evening cocktail or after-dinner aperitif. The Okura Prestige Bangkok is connected to the Ploen Chit BTS (Skytrain) Station. 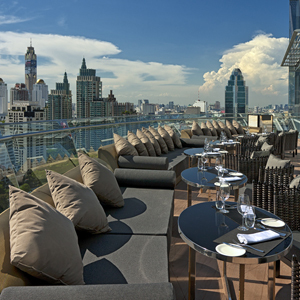 If driving, the Okura Prestige Bangkok can be found on the intersection of Phloen Chit and Wireless Road.